Wheelchair Ramps, EZ ACCESS Pathway Modular Ramp Systems, Portable Mobility Wheel Chair Ramps, Threshold Ramps at Global Industrial. EZ-ACCESS® SUITCASE® Folding Ramps Provide Convenience for Wheelchairs, Scooters and more. EZ-ACCESS® SUITCASE® Folding Ramps are made of welded aircraft-grade aluminum to provide long lasting durability. Ramps have applied slip-resistant tread and self-adjusting bottom transition plate for easy conversion from ramp to ground and to provide added safety. 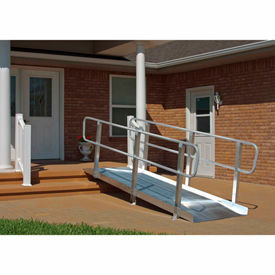 Portable to provides access to steps, vehicles, and raised landings with ease. Ramp can be separated for easy storage and transport. Flexible carrying handle. Styles are Singlefold Ramp and Triplefold Ramp. Dimensions vary per style. PVI Threshold Ramps Allow Ergonomic Access Through Doorways, Over Raised Landings, Curbs, and more. These ramps are made or 100% recycled rubber for impact resistance and lightweight aluminum for easy handling and transport. 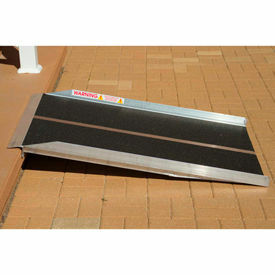 Rubber Ramps are easy to install and can be trimmed to size to fit individual doorways. Adhesive is required under the threshold for safe footing. 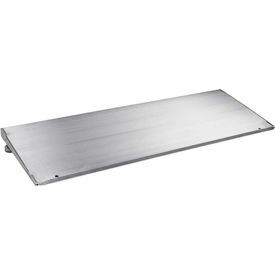 Aluminum Ramps feature slip-resistant surfaces for increased traction and safety. Include mounting holes for secure installation. Available types include Adjustable Threshold Ramp, Rubber Threshold Ramp, and Threshold Ramp. Weight capacities are 600 lbs, 800 lbs, and No Load Limitations. Dimensions vary per model. PVI Foldable Ramps are Portable Options to help Wheelchairs, Scooters, Walkers or Strollers Overcome Rise or Incline. PVI Foldable Ramps are welded from lightweight aluminum for long lasting durability and performance. Anti-slip surface provides safe traction. Single-Fold Ramp folds in half for easy carrying. Multi-Fold Ramp and Utility Ramp separate into two pieces or fold in half for carrying like a suitcase. Closure Strap locks ramp panels together for safe transport. All Ramps accommodate wheelchairs and scooters up to 800 lbs. with various wheel configurations. Dimensions vary by model. 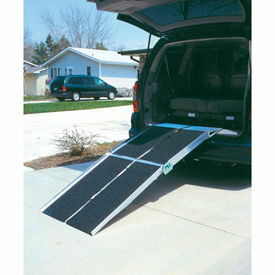 PVI Solid Ramps are Easy To Lift, Carry and Move into Position when Needed. PVI Solid Ramp is welded from lightweight aluminum for long lasting durability and corrosion resistance. Ramp underside is reinforced for added strength and holding capacity of up to 800 lbs. Rubber anti-slip surface provides better traction and safe footing. Containment edge on either side prevents wheelchairs, scooters, dollies and other equipment from falling off. PVI Ontrac Ramps Set Up in Minutes to provide Safe Entrance for Scooters, Walkers, Wheelchairs, and more. PVI Ontrac Ramps are all welded of lightweight aluminum for long lasting durability. Non-skid grooved surface offers superior traction and slip resistance. Extruded aluminum handrails and 2" curbs prevent wheelchairs and scooters from falling off. Ramp features temporary or permanent installation with included security pins to meet building codes. Dimensions are 84"L x 36"W x 7"H and 96"L x 36"W x 8"H.
The Americans with Disabilities Act (ADA) Requires that All Buildings Must Be Accessible to Disabled Persons. Failure to comply may result in monetary damages and civil penalties. According to ADA rules and regulations, for every inch of rise you must have a foot of Wheelchair Ramp in length. 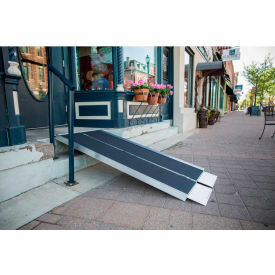 Convenient Wheelchair Ramps allow disabled individuals to easily access curbs in front of buildings. Handicap Ramps feature slip-resistant surface and curb edges for safety. 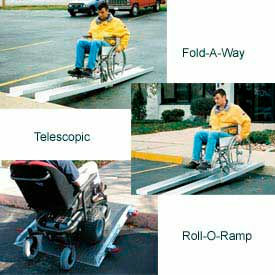 Fold-A-Way Ramps permit easy one-person storage and handling. Portable Wheelchair Ramps include 2 handles for easy positioning. Folded dimensions are 63"L x 7-1/4"H.
Telescopic Ramps have a lightweight aluminum construction and has a serrated surface for traction. Retracted length is 56". Roll-O-Ramp features wheels mounted to the curb of the ramp for portability and beveled ramp edges for a smooth transition from the Wheelchair Ramp to the ground.